Of all forms of motor sport, Formula One, despite its glamour, leaves the door open for list compilation and in-depth looks at the cars that took part. As with horse racing, where riders seem to enjoy more books written about them than the horses they ride, in the pinnacle of motor sport drivers receive more words than cars. Peter Higham’s book goes a long way in redressing the balance, and his in-depth look at that most exciting of the sport’s decades is superbly written, and superbly illustrated. The 1960s saw perhaps the biggest changes in Formula One, as cars moved towards the rear-engine configuration they have today. This was also the decade when sponsorship stuck its claws in, changing the sport from the domains of amateur gentlemen owners and drivers to a professional approach, which spelt the end for those garage-istas who could buy one of last year’s runners, convert an old coach into a transporter and hit the Formula One merry-go-round. Not all teams were amateur – far from it – but it’s those smaller teams that really make this story, those who took on the far more mighty Ferrari, BRM, Brabham and Lotus. At the start of the decade’s second half, for example, Reg Parnell Racing fielded ‘an old Lotus-BRM throughout 1966’ but driver Mike Spence ‘endured a difficult World Championship’. Other smaller teams put in a brave performance, as some privateers would into the next decade, but the days of the ‘minnows’ were disappearing. Each chapter begins with a summary of the year – not only who became World Champion – but notable races, driver performances and team progress. 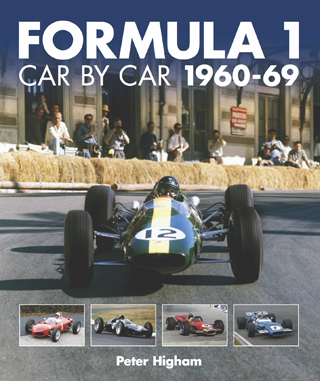 This is a first-class book that has a place on the bookshelves of anyone interested in Formula One’s history. Higham’s writing style is highly informative yet delightfully light, and not once does the reader get bogged down in too many statistics. The images, too, are a delight – cleanly-styled cars where spectators could see the driver working hard, while so much of the suspension was visible too – a reminder perhaps of much simpler times, before the following decade when Formula One morphed much more into what it is today.